Our mission is to help people become disciples of Jesus Christ by sharing the good news, worshiping God, loving others, learning from the Bible, and serving in God’s world. The first answer to “what we believe” at Corinth is easy: we believe a broken world needs the hope and grace only Jesus can give. We intentionally keep our confession simple, sharing the basic insights that connect the church of Jesus Christ around the world and throughout history. There is one God who exists in three Persons. God the Father created everything that exists. Jesus Christ, fully God and fully human, is the way to God because of his life, death, and resurrection. The Holy Spirit, one with the Father and the Son, convicts the world of sin, and glorifies the Father and the Son by indwelling and empowering the church. Naturally, most people want to know more about our beliefs than a short summary statement. Beyond these essentials (see below), you are likely to find a breadth of perspectives on issues that have often divided Christians and churches. “Reformed” in our name connects us to the sixteenth century Protestant reformation in Germany and Switzerland. 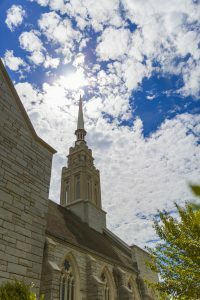 Our denomination, the United Church of Christ, tends to take more progressive/liberal positions, but we are part of the Faithful and Welcoming Churches of the UCC, a network of pastors and churches who consider ourselves ECOT (evangelical, conservative, orthodox, or traditional). Our pastors and leaders will be glad to respond to specific questions you might have, but for the most part we don’t want your preconceptions or ours to become a barrier as we get to know one another and seek God together. Contact us with any specific questions you may have about our beliefs. 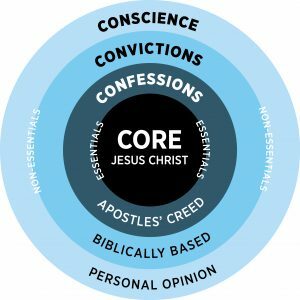 We consider the Core and Confessions to be Essentials. Our leaders (clergy and lay) should maintain a clear witness to the deposit of the historic faith in each generation. See Romans 1:16-17. Core – Jesus Christ, the Son of God, died and rose again for our salvation. He is Lord and Savior. Confessions – The Apostles’ Creed summarizes the faith common to Christians across the years and around the world – the Trinity, God as the Creator, Jesus as God’s unique and eternal Son by whose death and resurrection we are reconciled to God, and the Holy Spirit. We consider Convictions and Conscience to be Non-essentials. We lovingly include in our fellowship and cooperation those who differ because our ultimate goal is to attract people to Jesus, not to our way of thinking. See Romans 14:1-4. Convictions – Areas in which Christians disagree about what the Bible teaches, such as baptism, leadership roles of women, and details about the second coming of Jesus. Conscience – Matters on which Christians express and live out personal opinions without strong biblical reasons, such as worship styles or consumption of alcohol.